SMS Gateway - Client software, Excel SMS client II. Home > Product Manual > User Guide > Client software > Excel SMS client II. 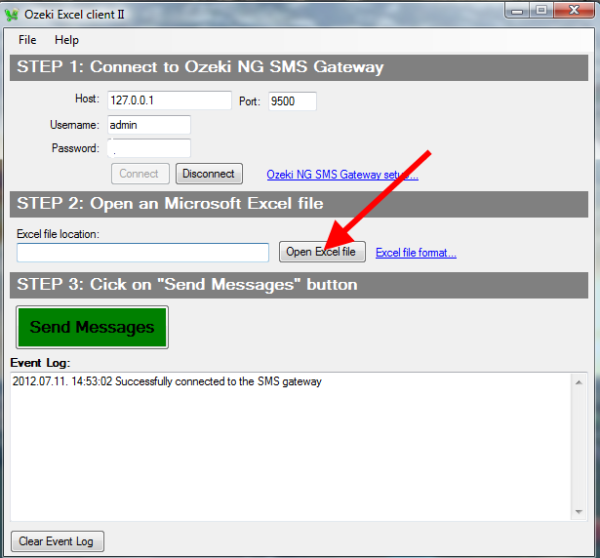 Ozeki NG SMS Gateway software makes it possible to send SMS text messages from MS Excel to mobile phones. 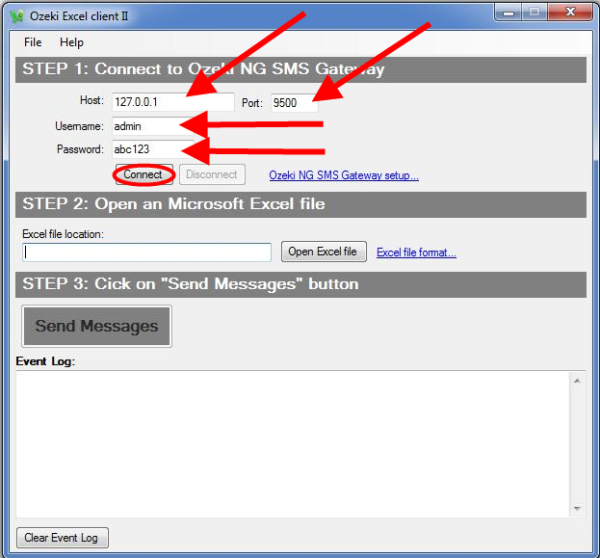 If you install Ozeki NG SMS Gateway software on your computer and you download the Excel SMS Client II., you will be able to send SMS messages from MS Excel tables easily. This solution provides fast communication with SMS text messages and it makes the bulk SMS sending simpler. Excel SMS Client II. supports SMS sending with international characters that are not part of the GSM 7-bit character set, such as Persian, Chinese, Arabic, Thai, Cyrillic, etc. You can find detailed information about this solution in this article. Ozeki NG SMS Gateway is a software product that provides bulk SMS sending and receiving functionality. With the help of Excel SMS Client II. 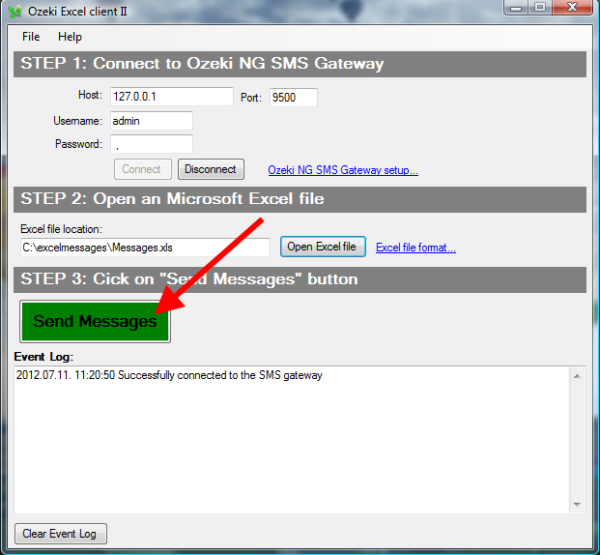 of the Ozeki NG SMS Gateway you can send data from MS Excel tables as SMS text message to mobile phone numbers. With a simple click in the Excel SMS Client II. your SMS messages will be sent out and you do not need to use other applications and forward your messages using complicated application interfaces. The whole process is faster and simpler with the Excel SMS Client II. and you can also send your messages with all international characters types. The Excel SMS Client II. enables you to send SMS messages from Microsoft Excel. All you have to do is to fill the Excel cells in a given order. In Excel, entering information in or applying a function to a range of cells can be done by typing, copying and pasting or dragging cells. After the Excel spreadsheet is edited so it contains all mandatory values (the phone numbers where each SMS message need to be sent to, SMS message texts, message types), please open the Excel SMS Client II. On the interface of Excel SMS Client II. at STEP 1. you need to give the connection details (Host name, Port number, Username, Password) to connect to the Ozeki NG SMS Gateway software and then please click on Connect button (Figure 2.). At STEP 2. you need to browse the edited Excel file which contains your messages, recipient phone numbers and message types. Please click on Open excel file button to start to browse (Figure 3). If message sending is finished successfully, the following window will appear as the result (Figure 6.). 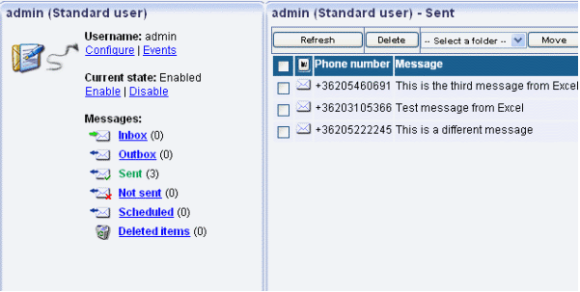 You can see the sent SMS messages with all information at the Even log field. 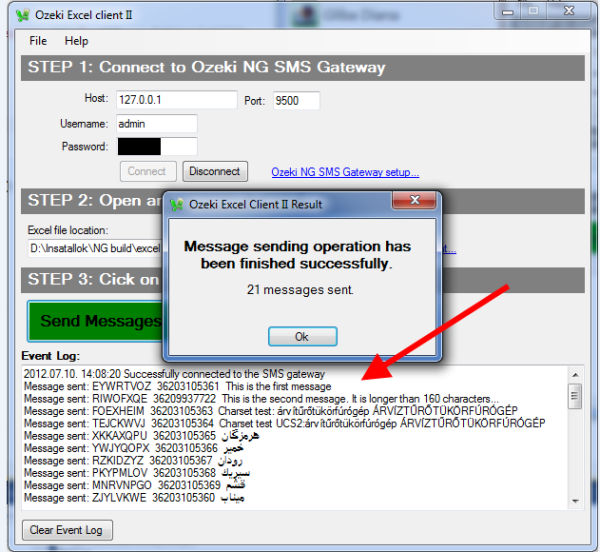 If you take a look at Ozeki NG SMS Gateway you can see the sent message in its "Sent" message folder (Figure 7). 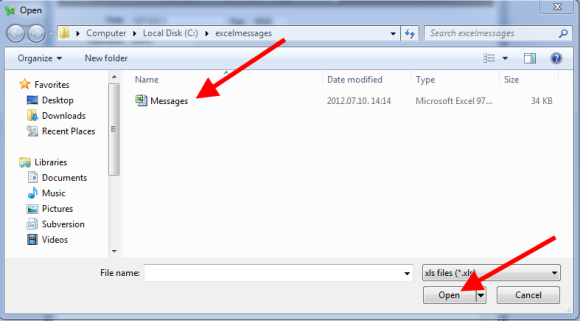 SMS messages with different character types can be sent easily and with high-efficiency using the Excel SMS client II. of the Ozeki NG SMS Gateway. If you implement this solution your corporate communication with customers, business partners and employees will be faster and simpler. The implementation of this client is not complicated, it can be used without complex IT knowledge.You can save much time and energy then using other applications to send your SMS messages from MS Excel. You can find a comparison chart for our two Excel SMS Clients on this page: Compare Excel SMS Client to Excel SMS Client II..